All Von Ormy homes currently listed for sale in Von Ormy as of 04/22/2019 are shown below. You can change the search criteria at any time by pressing the 'Change Search' button below. If you have any questions or you would like more information about any Von Ormy homes for sale or other Von Ormy real estate, please contact us and one of our knowledgeable Von Ormy REALTORS® would be pleased to assist you. "Wouldn't you like to live in this amazing property minutes away from SA? This is the property for You! 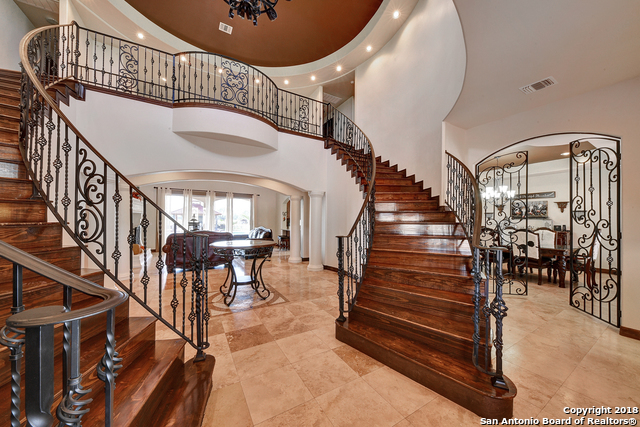 Located on 10.1 acres, its this amazing house 5263 sq ft. 5 bedrooms, 4.5 baths. Dual Staircase, High Ceilings, a Kitchen Made for a Chef, Granite Countertops, Built In Refrigerators, Traventine Marble, Man Cave, Covered Patio and Outdoor Kitchen that overlooks the pool. Just one word describes this property- Amazing! Also you can have your own farm in back of your property. Motivated Sellers!" 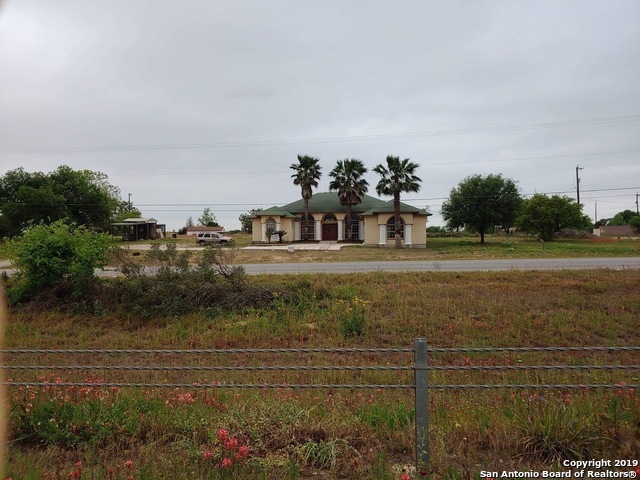 "Two homes on 16.96 acres of land within minutes from San Antonio and Somerset. Property does come with oil well." "Great Investment Opportunity Unique home.Lot of extra . A walk to remember, Beautiful double door entrance and large Foyer with two beautiful chandeliers with variable Majestic high ceiling.Arch windows,recess lighting and beautiful saltillo title through out.Large kitchen with stainless steel appliance.A kitchen retreat for gathering and entertainment. A huge game rm are for that pool table.The master bed room and bath provide a large walk closet and huge jet whirlpool tub to relax in"
"The Travis is the largest floor plan offered at the community and included five bedrooms and an impressive upstairs game room. Better yet, if you're looking for a downstairs master bedroom this is the floor plan for you! The master suite includes a walk-in closet and separate shower and tub. Stepping outside of the master bedroom is the kitchen equipped with gorgeous granite countertops, a bartop and energy-efficient appliances. The kitchen overlooks the dining room which is followed by the fami"
"The Spring floor plan entry opens up to a connected a large living room and a dining room across from the kitchen. This kitchen is complete with tons of storage space, granite countertops and a bartop that can be used for extra seating. This home is perfect for a larger family and includes four bedrooms, one of which could easily be used for a home office. The master suite and one of the additional bedrooms both have walk-in closets making this a comfortable and functional home for the whole fam"
"The Frio at Preserve at Medina is a one story, ranch style home with a connected two car garage. Through the foyer you are welcomed by a kitchen that overlooks the spacious family room. The kitchen has plenty of storage space and a bartop opposite the sink and dishwasher. The two additional bedrooms share a bathroom with a garden tub. The master suite has a walk-in closet connected to the bathroom where you will find a five-shelf closet for extra storage space." "The Canyon floor plan features a large family room that connects to the dining room with a half bath between the two. The kitchen includes energy-efficient appliances and beautiful granite countertops where you can add barstools for extra seating. Upstairs, you will find three bedrooms including a master bedroom with a walk-in closet. The utility room located on the second level of this home is functional and means no more carrying those pesky laundry baskets up and down the stairs." "What an amazing income opportunity! 1 additional building with current tenants plus 2460sqf in the main house! Fenced level lot with plenty of space for improvements. Both septic tanks have been carefully maintained and serviced. An additional storage space is also available in the property. Easy access to highway I35 and 30min form downtown San Antonio. Main house 2br, 2ba, Building 2: (2apt) 2br, 1ba/1br 1ba, Bonus Efficiency 1br,1ba. SOLD AS-IS"
"The Aspen is a spacious three bedroom, two story home with an attached two car garage. Walking up to this beautiful home, you are greeted by a welcoming covered front porch. Inside, the first floor has a spacious living room and functional half bath. The kitchen overlooks the living room and includes a bartop where you can add extra seating in addition to the connected dining room. The second floor includes a master bedroom suite with a walk-in closet as well as two additional bedrooms and a uti"
"Once in a while we list a REAL BARGAIN... THIS IS IT !! 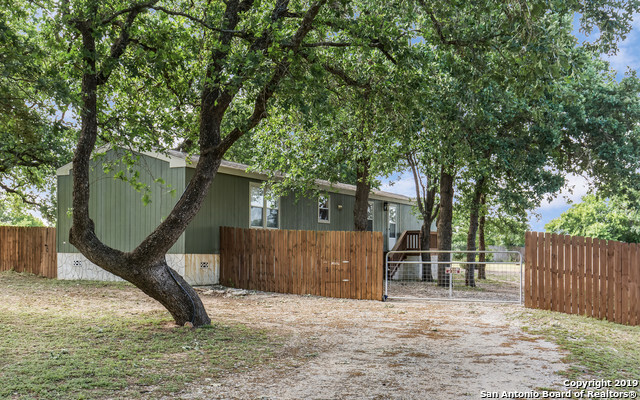 Tucked away on almost 1.5 beautiful tree filled ACRES you will find this VERY WELL CARED FOR, SUPER CUTE & COZY home. Featuring a spacious open floor plan w/ a relaxed indoor outdoor flow leading to the XXL back yard perfect for entertainment. A place that will make you feel like you are on vacation 365 days/year.This beautiful home comes w/ a fridge, a water softener & blinds on all windows. Did I mention the OVERSIZED SHED !? WOW !!! #LET"
"Beautiful home on wooded cul-de-sac in the sought after community of Savannah Heights. Nice appointments throughout. Large deck shaded by century oaks perfect for grilling and chilling. Large fully fenced .69 acre lot with storage shed in place. Plenty of room to install a swimming pool and children's playscape. Welcome to 320 Brianna Court!"